Since the proto-colorists were called "Fauvists," it has been my long time goal to study that most-noted Fauve, Henri Matisse (1800-1950). 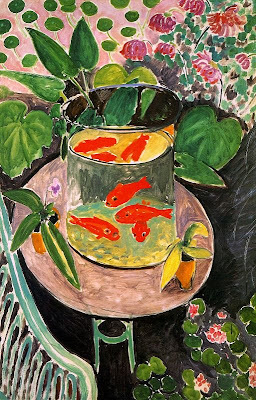 Matisse persisted in his ultra colorful style even after the era of the short-lived Fauvist movement (1905-7), which featured stylized realism and assigned non-local color to objects. The giant Pablo Picasso overshadowed Matisse as they both worked simultaneously to create Modern Art in the early part of the Twentieth Century. Picasso, the great Cubist, and Matisse, the father of Fauvism, were friendly rivals. The one brought us the line, the other brought us color in the Modern Art sense.